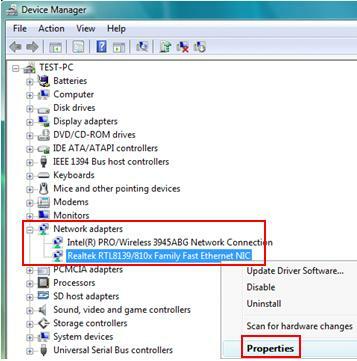 Wanna to check the network or wireless adapter driver status in Windows Vista? This article will show you step-by-step instructions on how to do it. Usually you might want to check the network adapter (either wired or wireless) status after the driver installation or there is network problem on your computer. 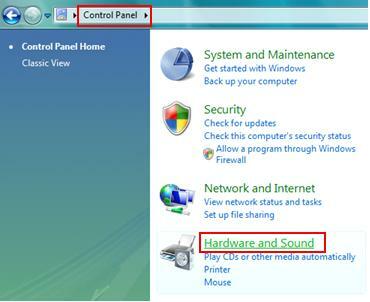 2) Click on Hardware and Sound in Control Panel window. Note: If your Control Panel is in Classic View, you can just double click the Device Manager. 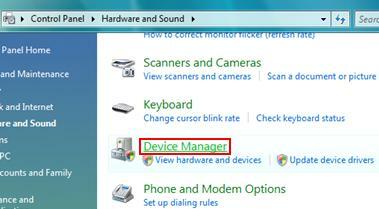 3) In Hardware and Sound window, click on Device Manager to open it. 4) The Device Manager will appear, then locate and expand Network adapters and right click the network or wireless adapter you want to check, finally click on Properties. 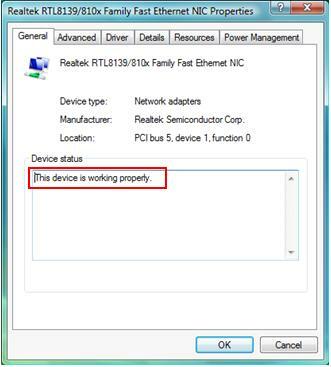 5) The network or wireless adapter properties window will appear, your driver is working well if it shows This device is working properly under General tab. You can also manually configure network adapter’s driver parameters under Advanced tab. Note: If your device does not work well, click on Driver tab to check driver details, update driver, disable driver or uninstall driver. Return to top of "Quick Way to Check Network or Wireless Adapter Driver Status in Windows Vista"! !